Quicken Loans released two new indices, the ‘Home Value Index’ and the ‘Home Price Index,’ as depicted in the graph above. These indices reveal that homeowners overvalue their homes in times of economic crisis. This can be seen in the graph where home values are significantly overstated by homeowners during the 2008-09 financial crisis. The opposite effect is seen when the market is rebounding: homeowners tend to undervalue their homes. The likelihood of gentrification is dependent on many variables, but one major indicator is racial composition. The likelihood of a neighborhood drops dramatically if more then 40% of the neighborhood is black. Likewise, neighborhoods with fewer than 35% white residents were significantly less likely to have gentrified between 1996 and 2009. Gentrification, it seems, can reinforce old borders of inequality. This chart shows the net domestic migration between US cities from 2011 to 2012 by educational attainment. Cities like San Francisco and Seattle gained highly educated workers while losing those with high school diplomas or less, while cities like Tampa and Atlanta gained less-educated new arrivals. Large cities like New York still gained population overall via immigration, but lost domestic population. Only 14% of houses are available to the middle class and 25% of those in New York, while 86% of Akron, OH homes are available to them. This study uses the median household income for the city with 31% of income going towards the mortgage. 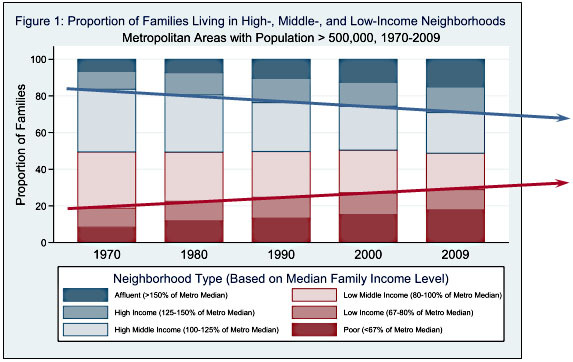 The proportion of people living in middle income neighborhoods is down from 65% in 1970 to 42%, a substantial decline and evidence of the stratification of American society. A number of countries including Israel, Norway, Switzerland, and Canada are experiencing very high and quickly increasing home prices. A number of investors have claimed these extreme high-cost markets to be bubbles. Delinquent mortgages are at their lowest level since 2008. Fewer than 5,000,000 loans are between 30 days past due and foreclosure. 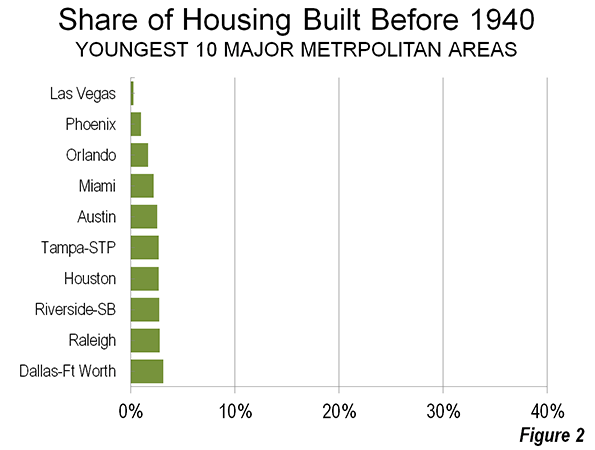 These fascinating graphs show the huge difference in the amount of housing built before 1940. 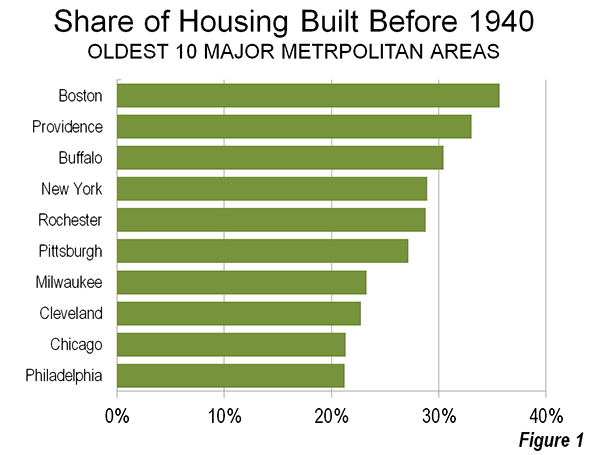 Boston is the leader with 35.4% of the city built before 1940, while Las Vegas is the newest city, with only .3% old housing. Considering Philadelphia is one of the oldest US cities, it’s position below younger cities like Pittsburgh and Chicago is a bit of a surprise.